This can also be known as Gastric Torsion, stomach twist or GDV. This is a condition that requires EMERGENCY treatment and the sooner it can be treated, the more likely it is that your dog will survive. It can occur in any breed but it is more common in large and giant breed dogs that have a deep chest, for example, Red setters, Boxer, Doberman’s and Great Dane’s. It is a condition that causes severe shock to the dog’s body and can be fatal if not treated immediately. A later sign is the abdomen becoming enlarged, very pale gums and an increased heart rate and eventually collapse! If a dog is presented with a GDV then it is likely he/she will be rushed straight through for the vets and nurses to get to work immediately! They will be put onto fluid therapy, and straight away in most cases, X-rays will be taken and action to decompress the stomach as soon as possible. Once the patient is stable they are taken in to surgery to explore the abdomen and reposition the stomach and spleen if displaced and to fix the stomach to the abdominal wall to prevent further twisting. Once surgery has been successfully performed the patient is still critical for around 24/48hrs post-surgery and food and water is very slowly introduced. Returning to a normal diet is between 3-5days as long as there are no complications! You will be taking you dog home with either a buster collar (lamp shade/cone of shame) or with a Medical Pet Shirt, which people prefer as they are less invasive for the patient. Contrary to common belief, feeding a dog from a raised food stand actually increases the risk of bloat, so avoid doing this and feed from the floor as usual. 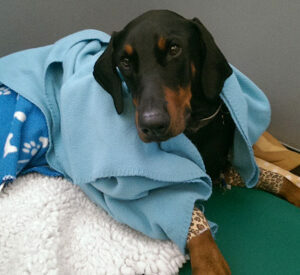 One of our Nurses, Jess, went through this with her Doberman only a few weeks ago. It highlights that no matter how careful you are it can always still happen to your pet and if you pick up on the signs early enough it can save your dog’s life. Thank you Jess and Westwood for letting us share your story! Westwood had had his usual dinner, fed an hour and half to two hours after his walk on Friday evening. Westwood was quite settled after eating and was sitting on the sofa. He did get up and drink quite a bit of water, which I did take away temporarily so he didn’t take too much water in after his meal. Westwood got back on the sofa and did not show any symptoms till a good three hours post eating. Firstly, Westwood just seemed a bit restless. He kept getting up and down from the sofa, as though he couldn’t get comfortable. He then spread out on the floor. He was still reasonably bright other than being a bit restless but instinct and being aware of the condition (GDV) made me know that he was probably starting to bloat. Being a nurse I knew that this could lead to the stomach twisting which is an emergency. Westwood didn’t appear bloated at this point but he started to seem a bit uncomfortable in his abdomen. He then stood up in a hunched position and was drooling. He then started to deteriorate quite quickly. I rang Vets Now at our Walnut Tree Hospital, to make them aware of the situation. As I was on the phone giving our details, Westwood started extending his neck right out and started retching but nothing came up. We immediately left the house and drove to the surgery. It was less than a ten minute drive but Westwood continued to retch unproductively, and once at the surgery he lay on the floor, he was obviously very unwell. Westwood still did not look bloated visually, although all the other signs were there, so I would urge owners not to wait until the abdomen appears distended. The Vets Now team were brilliant and immediately took an x ray of Westwood’s abdomen which did show lots of gas. Blood tests were taken and Westwood was placed on two drips and given pain relief. Luckily, Westwood’s blood levels were normal apart from being dehydrated. Dogs that are not bought to the surgery soon enough go into shock and their vital organs are compromised. Once Westwood’s pain relief had started to take effect, a stomach tube was passed consciously. Some food and liquid came through the tube but it could not be fully passed which indicated that his stomach was twisted. He was anaesthetised and quickly prepared for surgery. Westwood continued to receive intravenous fluids and intravenous antibiotics while he had his operation. His stomach had twisted at the top (the pylorus) and his spleen had flipped onto the wrong side. Some dogs require the spleen to be removed if the blood supply has been cut off, but Westwood was very lucky. The Vets Now surgeon passed the stomach tube again to empty the stomach fully and then repositioned it. She then performed a gastropexy, a procedure which involves suturing the stomach to the abdominal wall so it cannot twist again. Westwood continued to have fluids overnight and strong pain relief and over the weekend. Vets Now kept us updated with how he was progressing and we brought Westwood home late Sunday afternoon once he had started eating was more comfortable. Westwood has now made a full recovery. We are so grateful to Vets Now, but also to Milton Keynes Veterinary Group, who also looked after Westwood on Saturday morning to the afternoon before Vets Now took over his care again.